One of the beautiful things about Git is that you have so many ways of making it work for you. This is also one of the frightening things about Git, particularly if you’re just starting out. There’s loads of documentation and blog posts covering all the ways you can use Git to manage your code or shoot yourself in the foot. 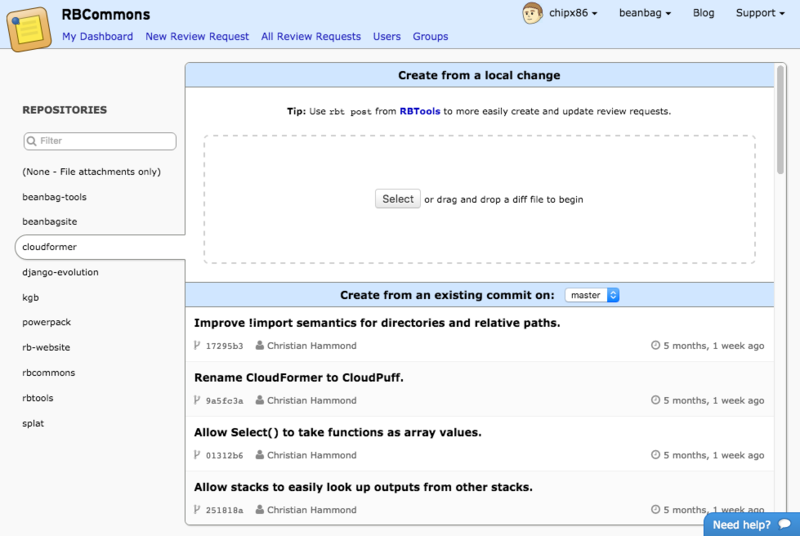 A question we’re often asked is how Git is supposed to be used with Review Board or RBCommons. Branches in Git are pretty great. They’re light-weight, and you can really choose when and how to use them. What we like to do is have one branch for every review request we’re still working with. Maybe they’re branching off of master, or maybe off of another change you have up for review… doesn’t matter. Create the branch, and create as many commits on it as you want. You’re going to post these all for review under one review request. For our example, we’ll use 2 commits. Now let’s create another branch off of that, and make one commit here. This will be for your second review request. Excellent. If you go to that first URL, you’ll see your summary and description filled in from your commit messages. You can edit these to your liking. If your server has any default reviewers set up, they’ll be assigned. You might also want to fill in some bug, add some testing information. Do whatever you want to do there and publish the review request. Now sit back and relax and… oh wait, you have a second change ready for review! Thanks to Git and RBTools, you don’t have to wait on that. Let’s post that one too. What you’re doing here is posting all the commits on my-branch-2 that were made since my-branch-1. No need to push my-branch-1 first, or really worry about it in any way. You’ll probably want to set the Depends On field to point to your other review request, as a hint to any reviewers deciding which to review first. This is probably familiar to you if you’re used to Git. You can use any Git SHA/tag/branch/revision range you want when calling rbt post. Note: If you’re posting against a remote branch other than origin/master, you’ll need to either pass --tracking-branch=myremote/mybranch on any RBTools command, or set TRACKING_BRANCH = "myremote/mybranch" in .reviewboardrc. The remote must match the configured repository on Review Board. Need to make some changes? -u to the rescue! So someone found a flaw in your otherwise perfect code. Happens to the best of us. In both review requests, you say? Okay, we’ll let that slide for now. Let’s update the first change. Lots of options here. You can make a new commit with the fixes, or you can amend the commit. If it’s just a fix made in a previously un-pushed commit, we like to amend. Your choice. Now on to the second. We’ll probably want the latest from my-branch-1 as well, so we can rebase or merge. We like to rebase when this stuff is still in flux and not yet pushed, and we like to merge when the history starts to matter (that is, when the code is in some kind of decent, landable shape). 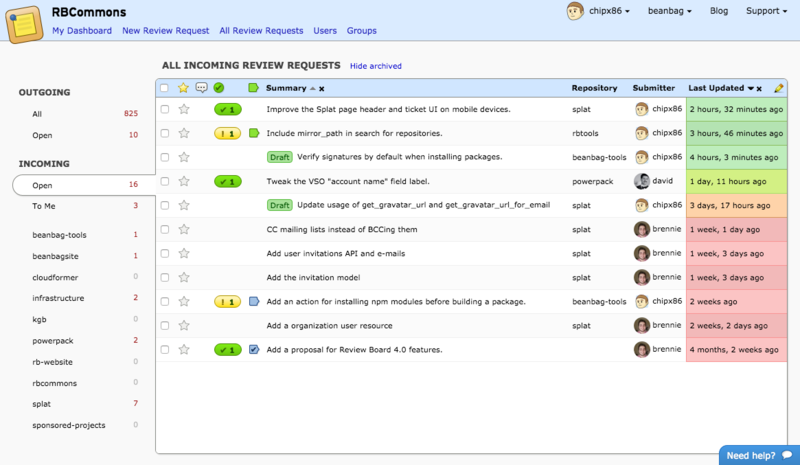 The -u flag updates an existing review request that matches your commit message. If you’ve modified the summary or description in any way, it may prompt you for any review requests that mostly match. Just say yes or no. Great, publish those changes. Eventually the code will be perfect. Got your “Ship It!”? Time to land! RBTools 0.7 and higher comes with a nifty little command, rbt land. This command takes a branch, verifies that it’s been reviewed, and lands the changes. Let’s land both of your branches, one after the other. This will verify that my-branch-1 is approved (at least one “Ship It!” and no open issues). It will then merge my-branch-1 into master, push it, and delete the old branch. Then it’ll verify, merge, push, and delete my-branch-2. Each branch you land will be merged into master, with a merge commit containing the summary, description, bug numbers, and review request URL. If you want to instead squash each branch into a single commit on master, you can use --squash. You can use --dry-run to see what will happen without actually changing your tree. Useful when you first start off. You can also edit the commit message using --edit, or leave out --push if you don’t want to push the branch, or add --no-delete-branch if you don’t want to delete the branches. You can also set the default branch to land into. The documentation goes into all the options that are available. We like to set up our review requests to auto-close when pushing commits. This is designed to work with rbt land. The auto-close hooks will see that and automatically close your review request, so you don’t have to. There’s really a lot of options here. Some people push changes and then use the web UI to post them for review. Some people generate their own diffs and upload them. Some like to merge their own branches. Nice code organization, since every review request has its own dedicated branch. Fast posting and updating of review requests. Less mess. No extra branches sticking around, and review requests are automatically closed. Confidence that every landed change has been approved. No slip-ups with pushing the wrong branch. Happy new year, everyone! Hope your holidays were fun and relaxing, with great company and wonderful memories. Mine certainly was, and now I’m back with some more tips and tricks to help you get the most out of Review Board and RBCommons. Last time, we discussed some tips for getting the most out of your Review Board dashboard. This time, let’s talk about how to keep your dashboard clean by automatically closing review requests when pushing changes. Post-commit hooks are a feature supported by many types of repositories and code hosting services. They allow you to execute custom code when pushing a commit, which is useful for kicking off a build, updating a website, or, in our case, closing a review request. For self-hosted repositories, this is usually a script that you drop in a directory. This script can talk to Review Board through the RBTools API. For repositories hosted on services like GitHub or Bitbucket these are often set up as URLs that the service can POST to. Review Board 2.0+ have some convenient URLs just for this purpose. We’ll talk about these first. If you’re running Review Board 2.0.7 or higher, we’ve made it very easy to get set up. Simply log into your administration UI and click Repositories. You should see a [Hooks] link beside any GitHub or Bitbucket repositories. Click it, and you’ll get exact instructions on how to get set up. Where, of course, the <review request url> is the full URL to the review request page. The hook will see that line, and close the matching review request for you, complete with information on the commit ID and the branch it landed on. The upcoming RBTools 0.7 release will make it very easy to include this automatically with a couple new commands. We’ll cover these in a new post once that release is out. One important caveat: These services need to be able to talk to your server. That means if you’re behind a firewall, you must grant access to these services and forward a port. If you’re on RBCommons, this won’t be a problem, though. And if you’re a GitHub user, look into using GitHub Enterprise with Power Pack for Review Board for a much more secure code hosting solution. Custom repositories are a bit trickier, because you need a custom script for your setup. If you’re running Git, we have a script just for you! All you have to do is fill in some of the details in the script, rename it to post-receive, and drop it into your official Git repository’s hooks directory. Not running Git? Unfortunately, there’s some work you’ll need to do for now. We’re working on some new scripts for Subversion and Mercurial, but if you feel up to it, you can put together your own post-commit hook, based on ours. All the communication is taken care of for you by RBTools. We’re gearing up for a major RBTools release, with the goal of shipping it this week. If all goes according to plan, we’ll be back next week with an overview of the new features, and how they’ll help you get your code posted and landed faster than ever.